Auto dealers in Fort McMurray had to deal with smoke and hot ash that burned into the paint of vehicles. FORT McMURRAY, Alta. 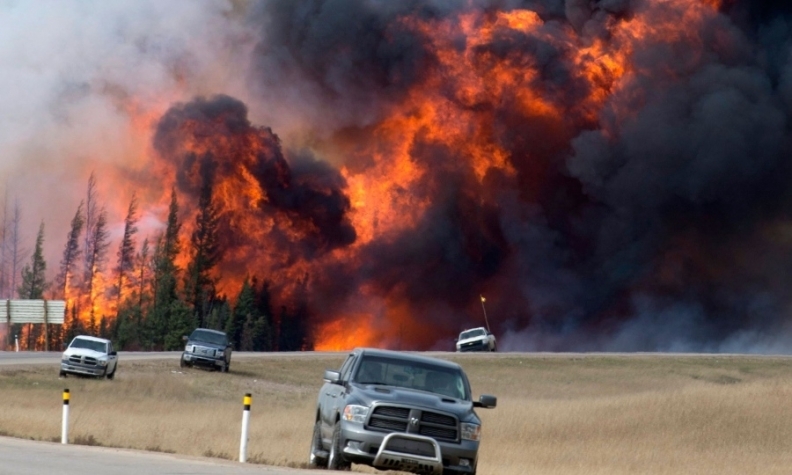 — The fire that ravaged the gateway city to Alberta’s oilsands a year ago claimed none of the four automobile dealerships there, although all suffered smoke and ash damage, and some lost employees who moved on after their homes burned. Northstar Ford Lincoln, Summit GM, Noral Toyota and Legacy Dodge were all spared by the fire dubbed The Beast, which threatened to consume the entire city. However, all faced daunting cleanups and employee vacancies once the flames were doused. Only Northstar dealer principal Marty Giles would give a figure on the cleanup cost for his $35.6-million operation that had opened in February 2015. “No buildings were lost, but cleanup ran to about $500,000 because all locations had to be completely cleaned,” says Giles, who lost his home and a Shelby Mustang in the fire. Some equipment at the service site about six kilometres from the main dealership was also burned. The cleanup effort was the same at the other dealerships: dealing with smoke and hot ash that burned into the paint of vehicles. As the city rebuilds, people are coming back and business is picking up. Fort McMurray’s population at the time of the fire was about 125,000, according to municipal census figures. Today it is about 61,300. Giles said business in the first quarter of 2017 is “about the same as 2016,” but he thinks the low 2016 numbers were due more to low crude-oil prices than the fire. Summit General Manager Trevor Christensen said business is good. As The Beast raged, dealers saw a duty to look after customers and workers. Northstar, Summit and Noral provide money for evacuated workers so they could purchase essentials, and the three dealerships met payrolls while the city was shut down. At the time of the evacuation, Northstar had 199 employees. “We’re back to that number now and we’re looking for another six to eight,” says Giles. Nate Clarke of Kaisan Auto Group, which bought Summit GM in January — four months before the fire — had 154 employees when the fire hit, and 28 of them lost their homes. He said 37 people have not returned and of those who did come back, “seven or eight” have left for a variety of reasons. At the height of the fire on May 13, Giles led a team of nine to his dealer-ship in FortMcKay, about 54 kilometres north of Fort McMurray, to establish a service operation for first-responder vehicles. Christensen said Summit was the first to reopen after people were allowed back into the city. “We have a big indoor showroom we call ‘the barn’ that will hold 80 vehicles. We turned it into a place for insurance people to work and it gave people (residents) a chance to solve issues on-site.” The parkade became a detail shop to handle the cleanup of vehicles on the lot and for customers. Simpson said the fire had advanced to a hill across the highway from the dealership before it was stopped. Today he sees a lot of positives for Fort McMurray. Noral had 27 people on staff before the evacuation and only a few have not returned.